Tripoli Road is closed. <Insert wailing and gnashing of teeth here.> Most of you don’t care…but Tripoli Road being closed represents inaccessibility to any number of trails around the White Mountains. There’s lots of little roads in the White Mountain National Forest that give access to trailheads, but in winter, they get closed down. No plows are harmed in the maintaining of these roads in winter. Oh, well. I found out that Tripoli Road was closed when I was forced to turn around at the gate, intending to ascend Mt. Tecumseh from the north. No such luck. Instead…I had to head over to Waterville Valley Ski Area to the other end of the trail for the ascent. The trailhead is near the end of parking lot #1, to the right of the main lodge: 2.5 miles to the summit. The trail condition was muddy and wet at the bottom, with increasing amounts of ice and hardpacked snow above 3,000 feet. There’s a side trail about 2,600 feet up that overlooks a ski slope. I say a couple of guys in helmets heading down across the slope, one of whom waved…and was smoking a cigarette. The wind must have been just right, because from a good hundred feet away, I could smell the smoke. Something about that smell just hangs in the nostrils. 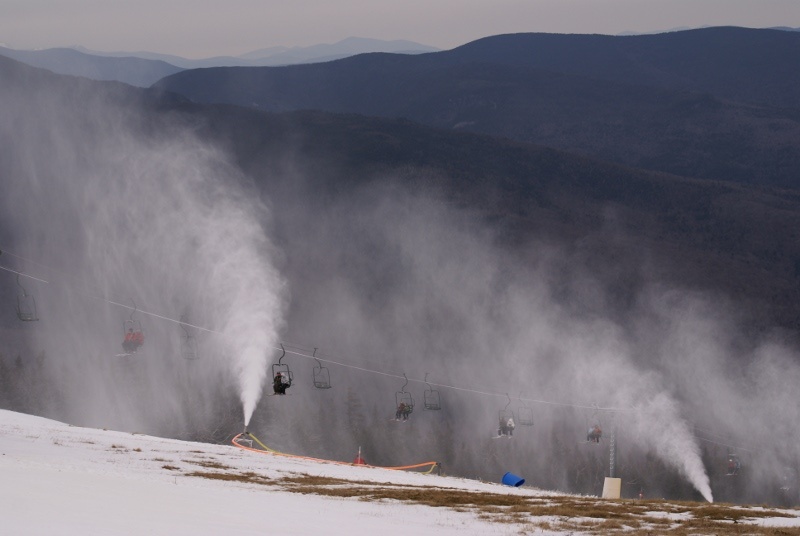 The sound of snow guns was another memorable oddity of this hike, as Waterville Valley was making snow for the ski season. 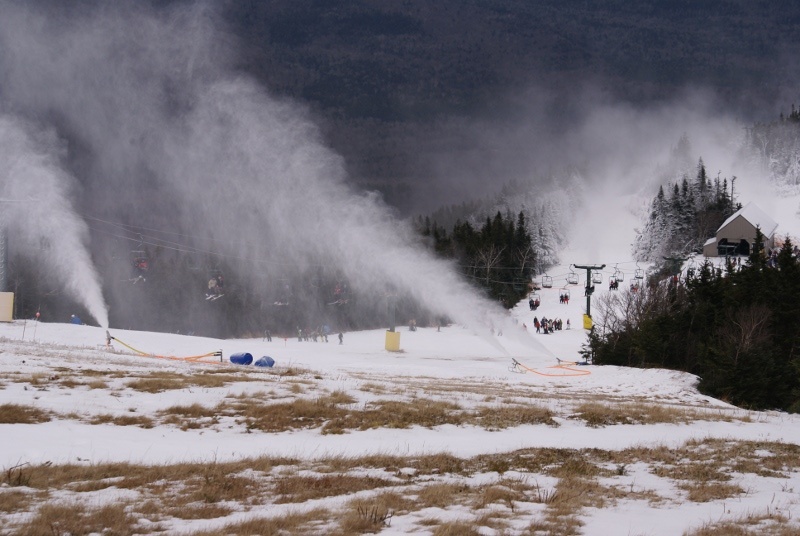 A snow gun sounds like a cross between a jet engine and a waterfall. 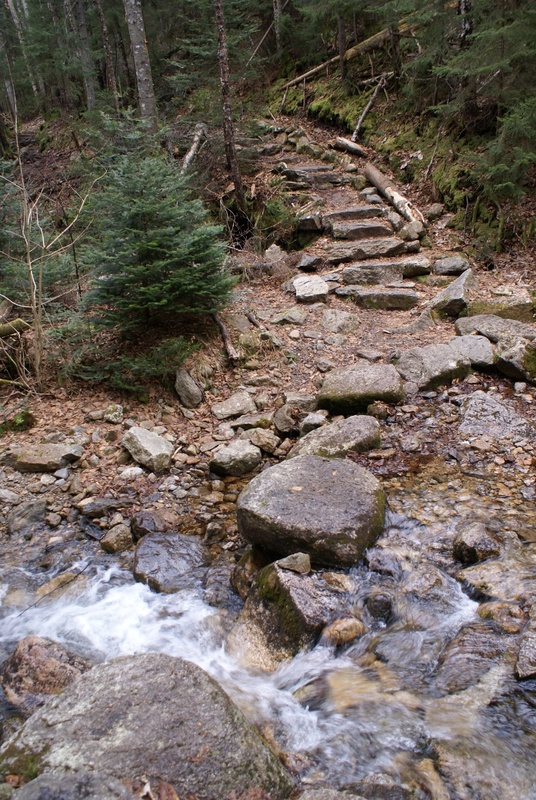 At times, you think you’re hearing a stream, but the sound is louder and steadier. Whereas water flowing has irregularities in the sound, a snow gun just goes non-stop at the same pitch and intensity at all times. I had a good excuse to wear my Kahtoola Microspikes. I got sick of slipping on icy patches, so I just put them on. I saw other folks on the trail as the day progressed, and no one else was wearing traction. I was happy to have it, though. 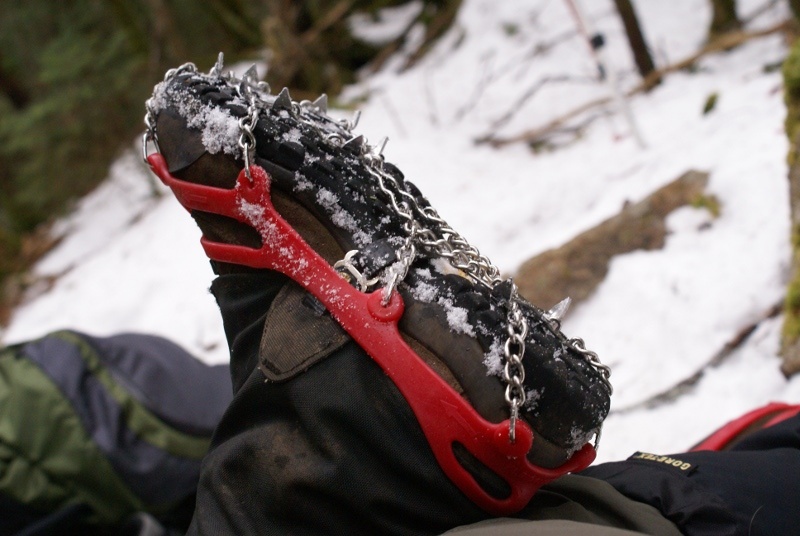 The microspikes made for confident footing, where before I had to be picky about foot placement (and was still getting it wrong at times). The microspikes were amazing. Mt. Tecumseh summit is forgettable, in that you are surrounded by trees. You can peek out to surrounding mountains, but overall, its one of those peaks I bagged because it’s on the AMC 4,000 footer list, and also because my wife had already bagged it. I’m trying to catch up with her, so that we can hopefully finish the 4,000 footer list together. 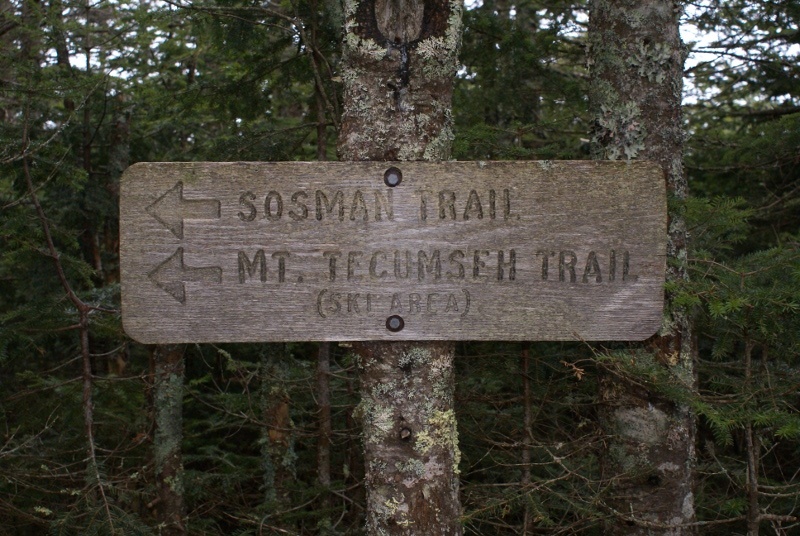 Near the summit, I did an out and back down Sosman Trail, which takes you past a cell tower and dumps you off near the top of the ski slopes. There are decent views there, plus I was able to shoot some pictures of the snow making and early season skiers. All in all, a nice day, despite the clouds.